Half Sheet Linen Backed (22" X 28") Style A. This poster was in C8 Excellent condition prior to linen backing and restoration. This is a guaranteed original movie poster. This is not a REPRINT or a REPRODUCTION. 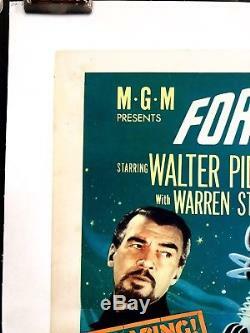 A sci-fi poster collector favorite, this style A half sheet boasts exceptional color and condition. This style half sheet is much more rare than the Style B half sheet and much more sought after by movie poster aficionados. 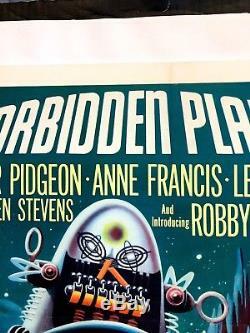 Leslie Nielsen is Commander John J. Adams, who arrives on a planet to investigate the sudden absence of communications from its colony of scientists. He soon discovers all of the scientists are dead - all save Dr. Morbius (Walter Pidgeon) and his daughter Altaira (Anne Francis). The rest have been killed by a strange monster roaming the planet. 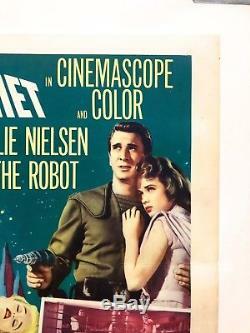 This style of the half sheet features not only the famous image of Robbie the Robot and his unconscious victim, but the rest of the main cast as well. 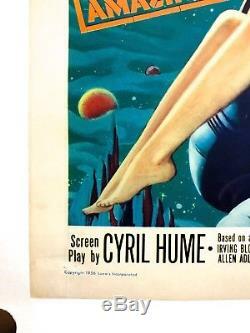 This poster ships rolled and is in C8 Excellent condition. Restoration addressed the fold lines and minor surface scuffs, paper loss, pinholes, etc. The photos above are of the actual item you will receive so please check them for condition. 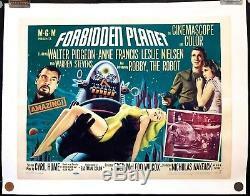 The item "Forbidden Planet 1956 Original Half Sheet Movie Poster Linen Backed Style A Rare" is in sale since Monday, December 18, 2017. 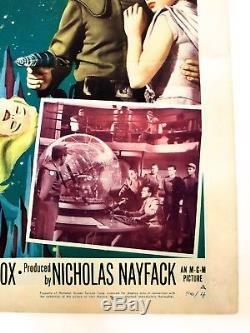 This item is in the category "Entertainment Memorabilia\Movie Memorabilia\Posters\Originals-United States\1950-59".